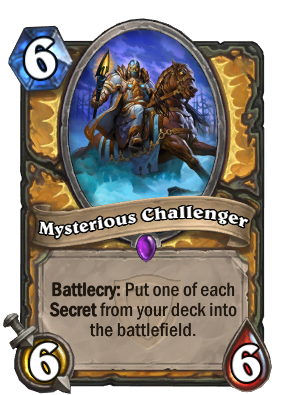 One of the biggest new deck developments in competitive Hearthstone coming from TGT is the card Mysterious Challenger. A solid card for it’s value in mana cost, it has the additional benefit of putting out a number of Secrets onto the battlefield, giving the Paladin huge tempo swing potential in the mid-game. Let’s take a closer look at this new force on ladder. Secret Paladin is a variation of the original mid-range Paladin deck. The objective of the deck is to simply get maximum valueout of your early game 2-drops: Knife Juggler, Shielded Minibot, and Haunted Creeper, by following up on turn 3 with a Coghammer or Muster for Battle to further control the flow of the board into mid-game. Paladin naturally has some of the best Turn-4 plays with Truesilver Champion, Blessing of Kings, and Consecration all being very efficient solutions to holding the board down against a variety of situations. Naturally, Piloted Shredder value in combination with the early game dominance creates a strong board that will last you until turn 6. At this point, the Mysterious Challenger appears. This is THE card that makes Secret Paladin the dominating deck. Whether or not you are ahead on the board at this point, this 6/6 drop will not only provide you with a healthy anti-BGH minion on the board, but it also takes every Secret in your deck and makes a hat for Uther out of them. To truly appreciate how powerful this card can be, imagine playing a 6/6 (Mysterious Challenger), a 2/1 (Noble Defender), a 3/2 (Avenge), a 2+/1 (Redemption), and getting a +1/+1 buff for all your minions (Competitive Spirit) for 6 mana flat, all while thinning out your deck to get to the cards you want faster. Assuming Redemption triggers on Noble Defender, that is a combined 13/10 in raw stats for 6 mana plus some bonuses here and there with the variance of Competitive Spirit and Repentance. To round out the balance in this deck, we have Dr. Balanced himself, along with Loatheb, Sylvanas Windrunner and Tirion Fordring. All three legendaries in this deck serve to turn a close game in your favour. Dr. Boom naturally has fantastic value with the potential variance of his Boom Bots. Loatheb allows your to stall lethal from your opponent against the Face Hunter, Freeze Mage, and Oil Rogue matchups. In addition, he can make it very difficult for your opponent to respond in a tempo efficient way when you are pressing for lethal yourself. Sylvanas is often difficult to deal with if left unchecked to trade and can usually go 1 for 2 especially if your opponent is looking to play a high value minion on his turn. Tirion Fordring has always been a solid choice for Control Warrior, but with the synergy of his Divine Shield with Blessing of Kings, Avenge, and Competitive Spirit, he can wreck havoc while solidly controlling the flow of the board with his Taunt. Plus, he’s such a nice guy that even after death, he’ll help you by giving you his Ashbringer. In this section, we will discuss possible edits and variations of the Secret Paladin deck above. Please note that nothing is set in stone; everything is here simply to open up questions about how to approach the game. The secrets that are to be included in this deck are possibly the place where there could be the greatest variance from player to player. There seems to be general consensus that Avenge and Noble Defender are good enough to include two of each simply because of the pure stats that Avenge provides and the mid-game tempo control Noble Defender offers. In general, the question I ask is “How would I feel if I got stuck with a copy of *insert Secret here* in my hand after I mulliganed?” For Avenge and Noble Defender, since they synergize really well with Muster for Battle and Knife Juggler, generally, it feels fine playing it on turn 1 and letting it sit. However, Redemption, Repentance, and Competitive Spirit are another story (Don’t even get me started on Eye for an Eye). Generally, these cards are dead cards in the early game and do not help you in establishing the control you need on the board. However, in combination with each other, assisted by the Mysterious Challenger, they are pretty strong as a tempo play. Thus, I include one of each. The selection in the end, however, is entirely up to you. Sylvanas Windrunner is my mid-late game choice to round out our later game. However, this spot is certainly open for debate. Quartermaster synergises well with our Muster for Battle. Spectral Knight gives good control against Patron Warrior and isn’t able to be killed by any AoE spell in the game. You could even include another Secret in this slot. One of the most popular variations of this deck is to put in Secretkeeper(s) to get some crazy face damage on while your Mysterious Challenger gives you your wall of Secrets. This is certainly a variation to try out for yourself. I personally recommend taking out a Coghammer and Sylvanas if you want to try this version of the deck. This style plays very cleanly up against both Tempo Mage and the mirror matchup, however you do have to ensure that the board is safe for your 2-Health Secretkeeper. So if you have the dust, put together your own version of the Secret Paladin. The Mysterious Challenger will look to bring many question marks in the future about the state of the game, but he will bring even more to the battlefield.